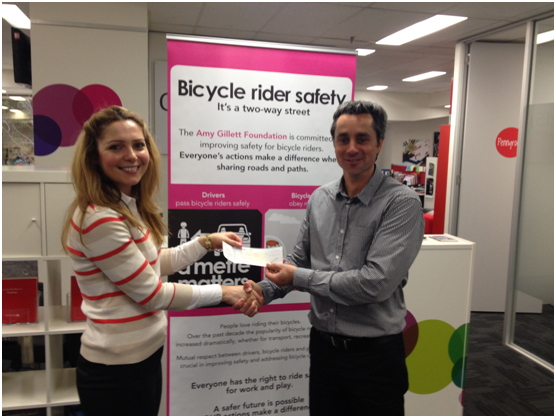 Last week was a proud moment in Bike Chaser’s life: our first donation to the Amy Gillett Foundation! I sat down with David Lee (Head of Partnerships and Fundraising), Sean Sampson (Communications and Advocacy Manager) and Sarah Allen – the newly appointed Head of Communications, to present our first cheque off the back of our auction proceeds over the last few months. Special thanks again to our phenomenal partners Total Rush, BH Bikes Australia, Atelier de Velo and Bike Force Docklands for their help in making it all come together. For anyone unfamiliar with the fantastic work of the AGF, they are a charity with the mission of reducing the incidence of death and injury of bike riders and to promote safe cycling in Australia. Amy Gillet was an Australian cyclist tragically killed in Germany by an out-of-control motorist whilst cycling with her national team. The Foundation was set up by her husband Simon Gillett, who is now the Executive Patron. – Traffic calming or lowering of speed limits. – Creating a better cycling environment in high-crash areas and dangerous sections of roads and intersections via a minimum percentage of the road/pathway infrastructure budgets being allocated to cycling-specific improvements. 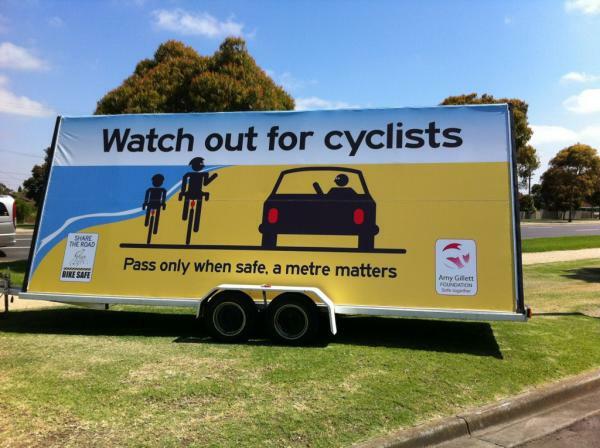 – Changing road rules for greater safety. – Improving education around bike safety in schools, within drive tests, and teaching safety skills for parents to prevent the big drop off in cycling participation once kids hit year 12 and can no longer ride on the footpath. In early May, the AGF submitted a national petition to parliament with almost 30,000 signatures, calling for improved cycling safety in Australia. This petition aimed to have drivers allowing a minimum of one metre when overtaking bike riders in speed zones of up to 60 km/hr and 1.5 metres when in a speed zone over 60 km/hr. This ranks among some of the largest petitions submitted in terms of signature numbers, and is now on the federal record. This is an important marker, particularly due to the fact that each state governs their own road rules – limiting federal consistency on the issue. Having recently completed their “It’s a Two-Way Street” campaign booklet for NSW, AGF are looking to create state by state versions of these over the next 12 months (starting with Victoria and Tasmania), demonstrating their strong partnerships with local police, transport authorities, governing bodies and local businesses – as well as support from national entities such as NRMA and Toll. She Rides is a skill-building riding program and social community for women cyclists throughout Australia. 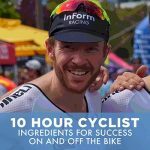 This eight-week program is available in 30 locations nationwide, includes face to face sessions with an accredited coach, and gives the option of either road riding or mountain biking.You can register your interest right here. – 14th September: Amy’s Gran Fondo completely closed roads in Lorne – three distances available from 14 km-110 km. – 2nd November: Amy’s Ride SA from city to sea. Vines along a car-free Southern Expressway – six distances available from 12 km-125 km. – 8th-15th November: Amy’s Share the Road Tour from Brisbane to Airlie Beach with the opportunity to learn and ride with some of the greats such as Brad McGee and Rochelle Gilmore. For the first time in 8 years, the AGF team will be reaching out to the community on Amy’s Share the Road Tour to ask to hear the stories of people who have experience road trauma themselves or with someone they know. The aim is to create dialogue and engagement with people through their grief journey, and to provide a potentially constructive avenue in dealing with the pain, as well as keeping their memory alive. Participants will have the opportunity to have their loved one’s name published on the AGF website (in memoriam). The team envisage this conversation becoming part of all upcoming rides in future. There are lots of ways to support all the wonderful work of AGF. You can make a donation, fundraise, volunteer your time, or look into a workplace matching donation program. We’d love to hear about any rides you’ve done with AGF, fundraising work or plans to participate.